First-In Fire Foundation and GreenTree Landscaping recently partnered with personnel at Fire Station 61 to improve the landscaping in front of the station at 5821 W. Third Street. Initiated by former firefighter and GreenTree Landscaping owner Michael Baer, the project involved planting succulents and spreading mulch that complements existing cactus varieties and other landscaping added over six years ago. 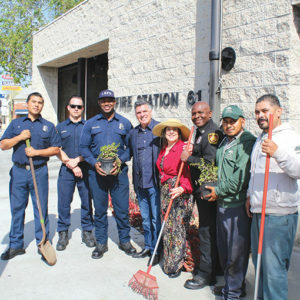 Landscapers weeded, aerated and amended the soil, trimmed white iceberg roses and refreshed the firehouse’s front yard. The project is a community-fire department partnership that focuses on long-term relationships. Spring is a perfect time to refresh the firehouse landscape, expand partnerships, conserve resources and strengthen morale and resilience, First-In Fire Foundation President Lyn MacEwen Cohen said. “As we nurture our gardens, we nurture ourselves,” Cohen added. “And we, by greening this model showcase firehouse garden, nurture those first responders that serve us so bravely and so well.